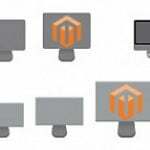 If you want to provide your customers with the possibility to buy products on a recurring basis on your Magento 2 store, you need to look for a reliable third-party solution with the appropriate functionality. Unfortunately, out-of-the-box Magento 2 platform doesn’t allow using subscriptions and accepting recurring payments. One of these tools is Adaptive Subscriptions for Magento 2 by Paradox Labs. With the extension, you can seamlessly integrate and manage subscription products on your store and accept recurring payments automatically. By implementing the module’s functions, you improve customers shopping experience providing them with a more convenient way of purchasing items they regularly need. Besides, the Adaptive Subscriptions extension offers the necessary functionality for selling subscription products to B2B clients. Thus, Adaptive Subscriptions for Magento 2 by Paradox Labs helps merchants increase the number of repetitive purchases and have stable profit. Below, we describe the features of this powerful recurring payments solution and explain how it works from the admin and customer perspective. The Adaptive Subscriptions extension allows store owners to sell any of their products on a subscription basis. Customers get the possibility to add an unlimited number of subscription and regular products to one cart, which improves the user experience. Besides, your clients decide whether to buy an item one time or on a recurring basis with an interval they select from available options. The Magento 2 subscriptions module supports the following product types: simple, virtual, configurable, bundle, and downloadable. Note that the Magento 2 module also allows guest visitors to buy subscription products with automatic registration at the checkout. As for the subscription frequency, Magento admins can disable this feature from the backend if necessary. As for other flexible settings, you set the length of a subscription (with a specified number of installments or unlimited) and decide whether to allow customers to pause and cancel their subscriptions. We should also say a few words about the billing functionality provided by the Magento 2 recurring payments module. Admin users get complete control over the billing process, deciding whether to run it automatically, from the command line, or manually. 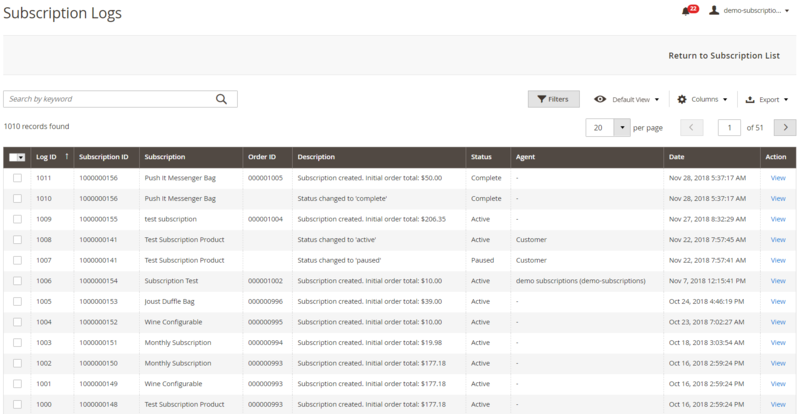 The subscriptions grid allows selecting particular subscriptions and starting billing process for them in bulk. It is also possible to specify blackout dates so that installments will not be planned for holidays, weekends, or any other day or period according to your needs. 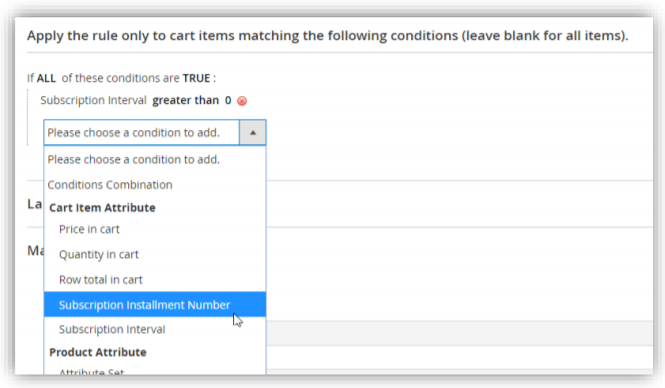 Furthermore, Adaptive Subscriptions for Magento 2 supports all shipping methods. Shipping costs are automatically recalculated for each subscription installment, which ensures accurate rates. In case an applied shipping method becomes unavailable, the system selects another shipping option with the lowest price. Another useful feature provided by Adaptive Subscriptions is the grouping of same-day subscriptions in a single order, which significantly saves time and cuts shipping costs. As for the payment options, the Magento 2 Adaptive Subscriptions extension supports various payment methods, including Magento Vault (Braintree and PayPal Payment Pro), Paradox Labs payment gateways (Authorize.Net CIM, First Data/Payeezy, and Stripe), as well as offline payments. Offline methods allow using bank transfer, cash on delivery, check/money order, purchase order, and more. Note that the module also supports $0 checkout. Such a wide variety of payment options lets your customers make purchases on your store in the most suitable way, which also increases their loyalty. Besides, store owners can configure email notifications that are sent to customers on the payment failure or as a reminder about the next billing cycle. 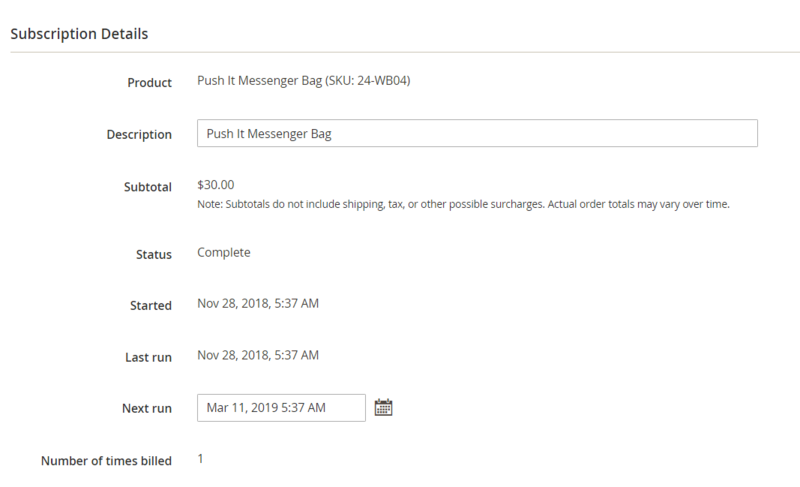 With the Magento 2 Adaptive Subscriptions extension, merchants are enabled to efficiently manage all subscription fees and set custom pricing for all product options. You can give customers a discount on the first installment payment, as well as charge setup fees or add an adjustment price to the initial purchase. It is also possible to apply coupons to the first subscription payment. For more accurate pricing, you can use conditions to set specific cart price rules depending on a customer’s subscription preferences. 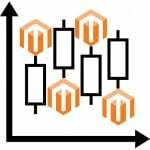 Also, note that all prices are converted based on the standard Magento currency conversion on a store view basis. As for other backend settings, admin users get access to the handy grid where they can view existing subscriptions and all necessary information related to them, as well as look for particular subscription products by applying grid filters. It is also possible to modify the details of every subscription, like status, installment date, frequency, shipping info, and more. Customers also get the possibility to manage their subscriptions in the dedicated tab in their profiles. Your clients can see the data related to their current subscriptions, update their payment and shipping details, as well as pause and cancel subscriptions. Now, when you understand the features offered by the Magento 2 subscriptions and recurring payments extension by Paradox Labs, let’s proceed to the backend description of the module’s functionality. Magento admins can manage all existing subscriptions and view their details in the relevant grid under Sales → Subscriptions. The grid supports filtering and sorting. You also decide which columns to show/hide and have the possibility to export the data on customer subscriptions into a CSV or XML file. Mass actions allow running the billing for selected subscriptions manually, regardless of the set schedule. To edit a subscription, click on it on the grid, and you will be redirected to the page divided into 4 sections: Details, Payment, Shipping, and History. In Subscription Details, you can change the description and the following date for installment (Next run). Besides, you can set different subscription frequency and length (number of cycles) and add notes for admin use. In the Payment Information section, you can select a different payment method from the available options saved in a customer’s account. 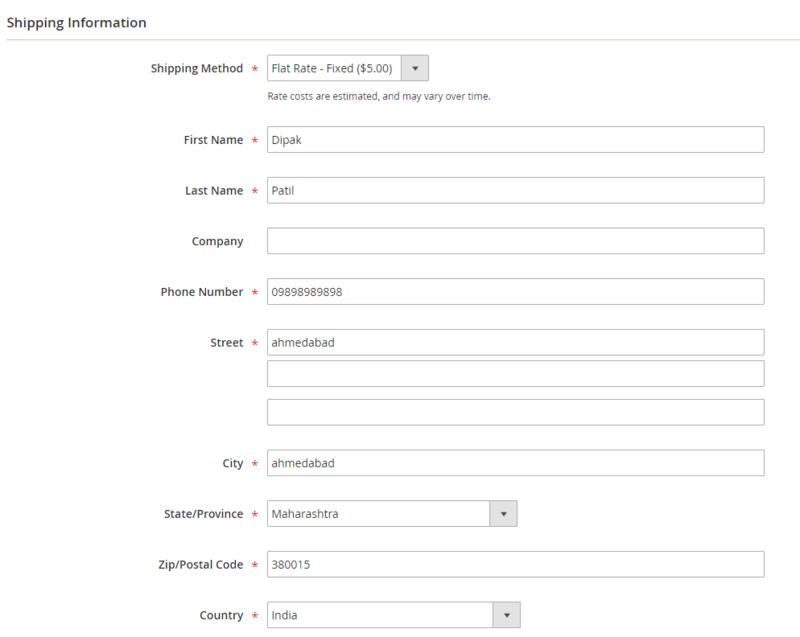 Next, you can change a shipping method and a customer’s shipping address. 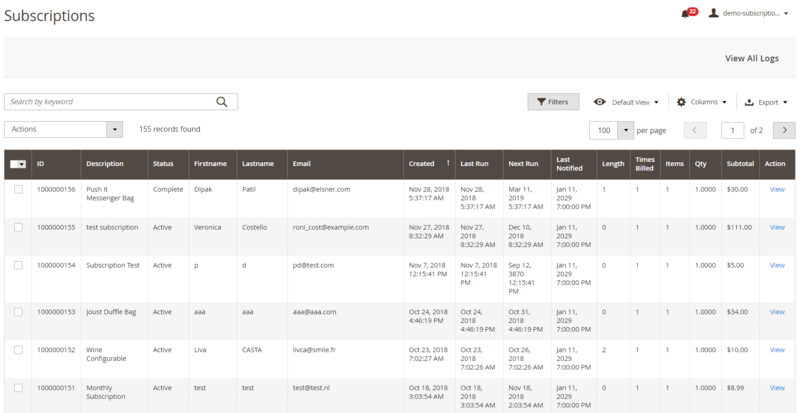 The History tab shows all actions related to the subscription with dates and status changes, order numbers, agent names, and more detailed description. Note that you can view the log with more detailed information on each subscription by clicking ‘View All Logs’ on the Subscriptions screen. Now, let’s see how to create a subscription for a particular product. Navigate to Catalog → Products and click on a necessary product on the grid. On the product page, scroll down to the Subscription section. Here, you enable the subscription to allow customers to buy the product with recurring payments and decide whether to activate the one-time purchase option. Next, you can add an unlimited number of subscription options that be available on the storefront for selection – specify their frequency, length (the number of installments), installment price, and adjustment price (for initial purchases). 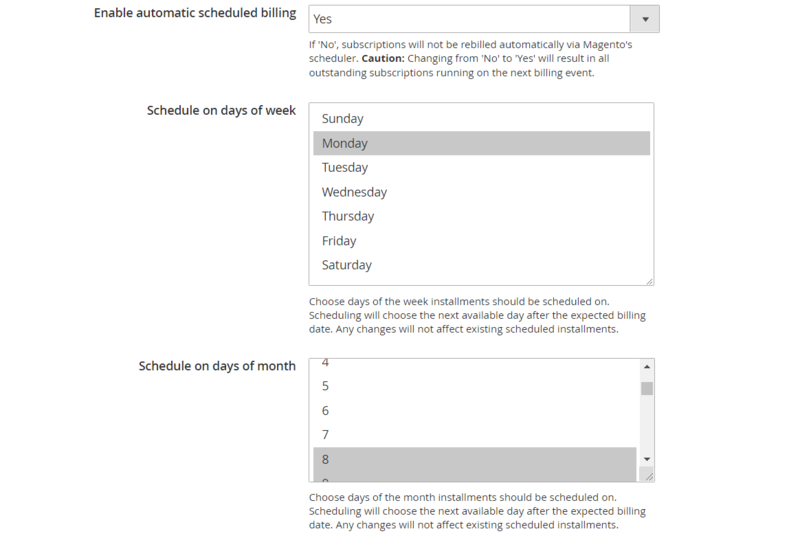 With the Magento 2 Advanced Subscriptions, you can also set specific rules for a subscription price. Note that the module adds two new conditions to the cart price rules: “Subscription Installment Number” and “Subscription Interval”. As for the extension configuration, here you will need to configure the settings in 5 sections: Adaptive Subscriptions by ParadoxLabs, Scheduling, Billing Failed Email, Payment Failed Email, and Billing Notice Email. 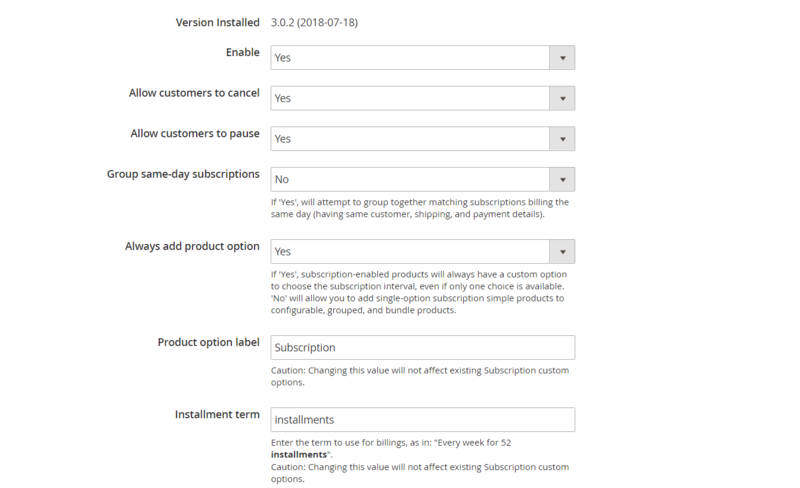 In the first section, you enable the extension, allow customers to pause and cancel their subscriptions, decide whether to group same-day subscriptions and display options for choosing a subscription interval, and specify text for product option label and installment term. In the next section, you enable/disable automatic billing using cron scheduling and select days of week and month for subscriptions scheduling. 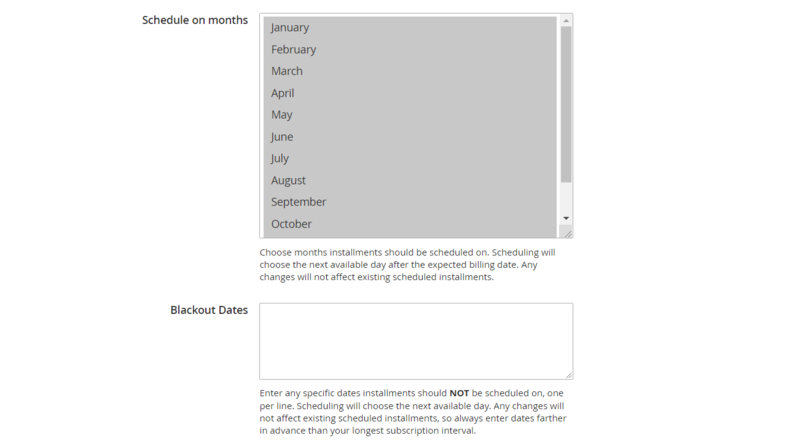 Here, you also choose the months for subscription installments and specify the blackout dates to exclude specific days from the schedule. 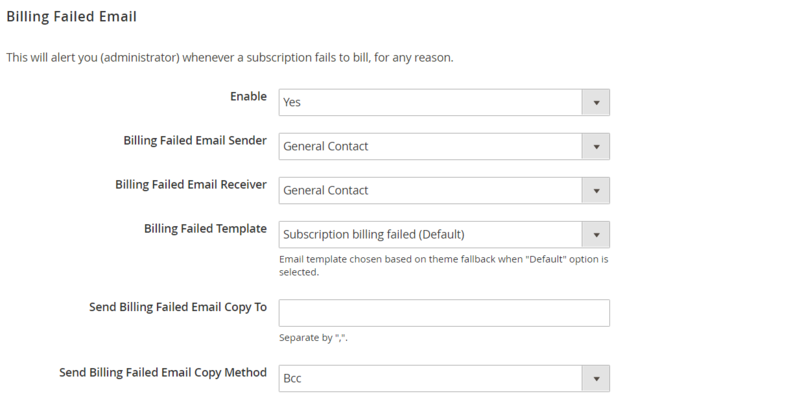 In Billing Failed Email, you enable admin alerts on the billing failure, select an email sender, receiver, and template, and specify emails for sending an email copy and how it should be sent (Bcc or Separate Email). The Payment Failed Email tab allows you to configure emails sent to customers when the subscription payment fails. Here, you should choose an email sender and template, as well as set options for sending an email copy. 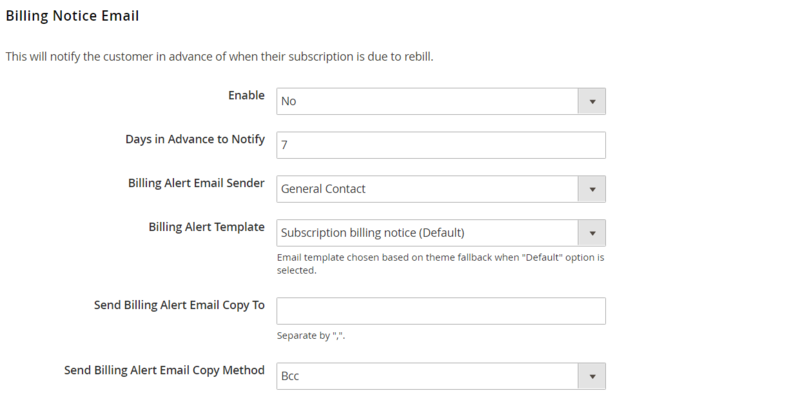 In the last section of the Adaptive Subscriptions module’s configuration, you enable/disable billing notice emails. Now, when you understand the configuration of the Magento 2 subscriptions module from the backend perspective, let’s have a look at its frontend functionality. 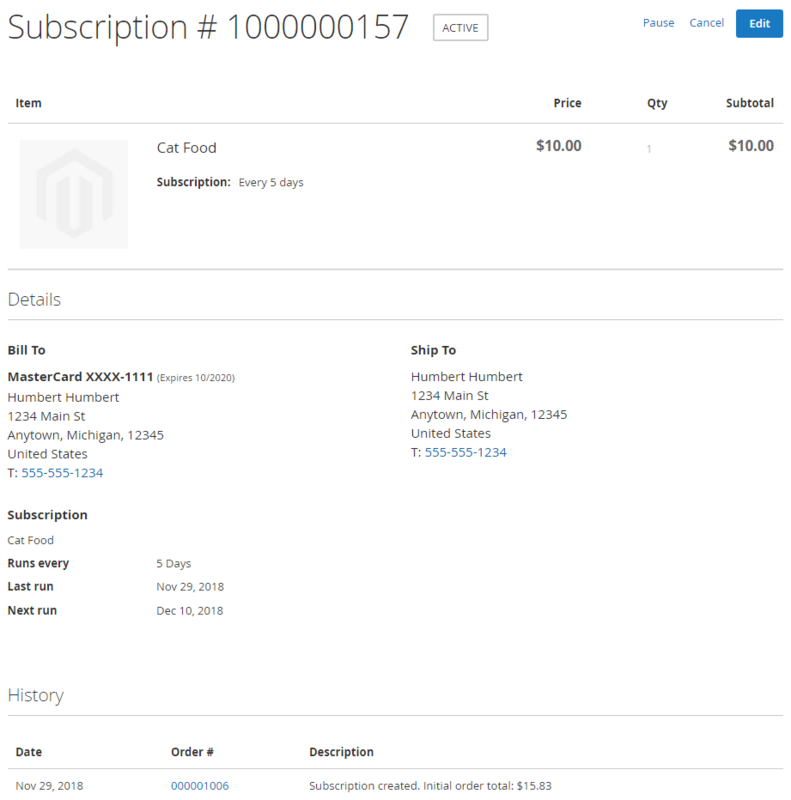 Adaptive Subscriptions for Magento 2 adds a new tab to the customer account. Under My Subscriptions, registered customers can view and manage their subscriptions. By clicking ‘View’, a customer opens more details on a subscription product, as well as gets access to the ‘Pause’, ‘Cancel’, and ‘Edit’ buttons. If a user clicks ‘Edit’, he or she will get the possibility to modify payment and shipping information. 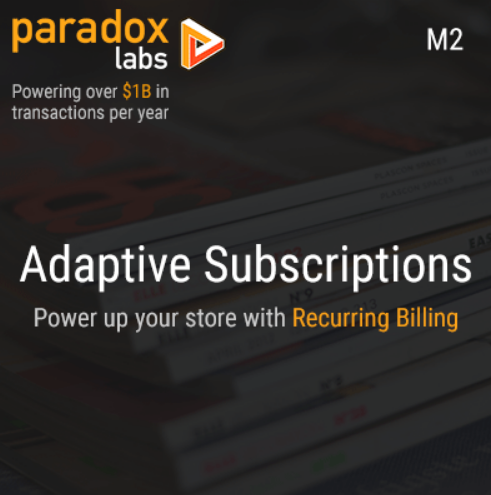 Adaptive Subscriptions by Paradox Labs is an excellent tool for ecommerce merchants who need to extend the functionality of their Magento 2 stores and start selling products on a recurring basis. The backend interface of the extension is flexible and admin-friendly, so you can efficiently adjust all settings according to your business needs. Customers also get an improved user experience on your store, which helps to attract more regular clients and increase loyalty to a web store.